Luis Gabrielle Moreno and Chinese partner Li Jiaman during the awarding of the gold medal. NANJING – Archer Gabriel Luis Moreno did the unexpected when he delivered the gold medal for the Philippines in the second Youth Olympic Games on Sunday. 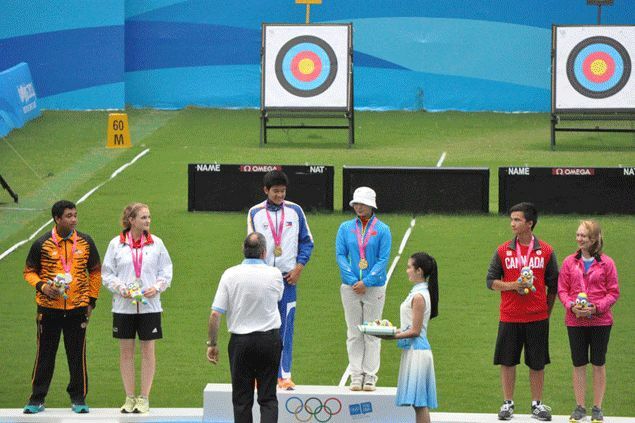 Moreno, who was ranked 30th among 32 male archers here, teamed up perfectly with China’s Li Jiaman, ranked No. 3 in the women’s side, to win the gold in the mixed team event. Moreno, the flag-bearer of the Philippine delegation in this event, said he didn’t expect to win anything with over 3,000 athletes from 202 Olympic nations competing. “I didn’t expect to win anything here. I just gave my best,” he said. Moreno almost missed the quarterfinals after he left the Fangshan Archery Field with his family to have lunch following the morning session. When they arrived in the venue at around 2:30 p.m. it was almost time for him to shoot. “I was already crying inside the cab and my dad was panicking. Everybody had warmed up. So I just concentrated,” he said. It’s the first gold medal for the Philippines in the Youth Olympics for athletes aged 14 to 18 years. In the inaugural staging of the event in 2010 in Singapore, the Philippines didn’t win a single medal. “This is a big win for us coming from a third world country,” he added. In the finals, Moreno and Jiaman defeated Muhammad Zoklepeli of Malaysia and Cynthia Freywald of Germany, 6-0 (38-37, 38-35, 37-33). Moreno clinched the victory with a nine on his last arrow. In the finals, he had 10s in the first and second sets. Jiaman had a 10 in each of the three sets. In the semis against Canada’s Eric Peters and Finland’s Mirjam Tuokkola, the 16-year-old Filipino archer had three straight 10s. Philippine chef de mission Jonne Go was ecstatic after the win. “Nothing is impossible. If we only focus on our youth, we can achieve more in sports. And it’s not only in archery. We showed that we can win in the Asian Youth Games and now we won a gold in the Youth Olympics,” she said. Philippine Olympic Committee president Jose Cojuancgo and Philippine Sports Commission chairman Richie Garcia left for Manila earlier in the day and missed the victory.